Using the highest quality materials EAS offer aluminium and toughened glass manual doors suited to any environment. Our aluminium doors are installed with concealed transom closers and bottom pivots designed for frequent use with low maintenance. Other features include low thresholds for DDA compliance and round anti-finger trap back stiles. Available in a wide selection of colours and finishes, our range of aluminium entrance solutions will compliment your brand in any building or premises. Using the highest quality materials EAS offer options for both aluminium and toughened glass doors suited to any environment. Our doors are fabricated here in South Lanarkshire and are made from the highest quality senior architectural aluminium. We use aluminium as it is strong and unlike timber and PVC it does not expand or contract in this weather making it extremely durable for today’s climate. Should you be looking for EAS to provide a quote for manual doors we would send out one of our engineers to take the sizes and provide a quotation based on the works required. The quote will vary depending on whether you require a single or double door set, if you need a new frame and also what sort mechanisms you require. All of this would be discussed with you on site. A standard single door is approximately 1.2m x 2.1m but every door is made bespoke for your unique sizes. Our aluminium doors are installed with concealed transom closers and bottom pivots designed for frequent use with low maintenance. Other features include low thresholds for DDA compliance and round anti-finger trap back stiles. All doors can be single or double glazed based on your preference and requirements and if you do install a manual door please bear in mind that this can be automated at a later date in most instances. Available in a wide selection of colours and finishes our range of aluminium entrance solutions will compliment your brand in any building or premises. There are over 200 colours on a European recognised chart called a RAL chart. The classic RAL system, is used for information defining standard colours for paint and coatings and it is the most popular Central European Colour Standard currently used. This chart is used not only by us but by architecture, construction and road safety so you can be sure your project will have colour consistency throughout even if dealing with numerous contractors. Here is a link to the on-line chart; www.ralcolor.com however each of our vans have a booklet so you can get a colour match on site if required. One thing to bear in mind is that aluminium is a very good conductor of heat which means that in the summer it won’t offer you much protection from the sun and likewise in the winter your premises may be poorly insulated. A solution to this is to offer thermally broken aluminium. The term “break” or “thermal break” means that it actually acts as a barrier to separate both sides of the aluminium frame (inside and out). The thermally broken section is installed with high U value double glazed units to help combat the elements. Therefore, in the summer it will stop the heat and likewise in the winter eliminate the cold coming in too. This option can be costly, so you would need to weigh up how much of a benefit it would bring you. They do offer a great energy efficient solution and improve insulation and it can also make the premises a little sound proof too. Toughened glass is a type of safety glass which is made by taking controlled thermal or chemical treatments to increase the strength up to 5 times compared with normal glass. Toughening the glass puts the outer parts into a compressed state and inside under tension. With the glass being under a stressed state when broken it actually breaks into small granular chunks instead of breaking into huge jaggy and sharp shards as normal glass does. Therefore, toughened glass is much safer and is definitely an option to consider if you are going to be in an environment where the glass can be at risk of being easily broken. Due to this being safer and stronger, toughened glass is used in a variety of different projects. This included but is not limited to, hotel doors, internal office doors, external shop fronts. EAS toughened glass manual doors are available in 10, 12 or 15mm options with a variety of different fittings available. We also offer full length top and bottom rails either 78 or 100mm wide and available in a range of finishes including brushed or stainless steel. We also offer patch fittings which are a smaller alternative to a full-length rail meaning that you have a more frameless look. All toughened glass doors are normally fitted with floor sprints, meaning that the door closer is actually fitted in the ground underneath the door leaf. 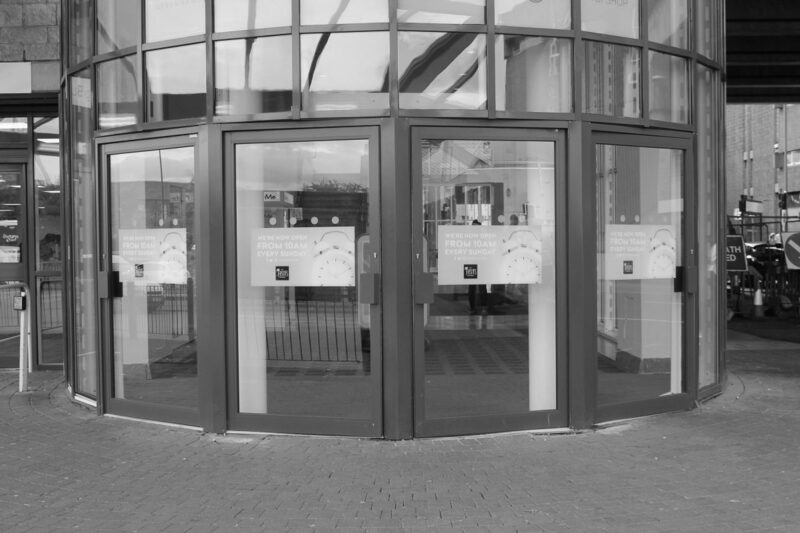 If you would like a FREE no-obligation quote specifically tailored to your requirements, then please get in touch to find out what Entrance Access Solutions can do for you. Entrance Access Solutions has a wealth of industry knowledge along with over 10 years’ experience. We believe we can offer an unrivalled technical experience with a great service which really does put us ahead of our nearest competitors. Munro Agency | Digital Marketing .